There is something of a cucumber convention happening in my fridge. Despite giving away cucumbers to everyone we meet, taking them with us on holiday and not eating less than a single cucumber at one sitting, the chooks still get to enjoy quite a few. There are round ones, white ones, smooth shiny dark green ones and stumpy prickly ones. All lovely in their own way. Growing them vertically means they don’t take up much room and they’re easy to grow outside in Wellington. 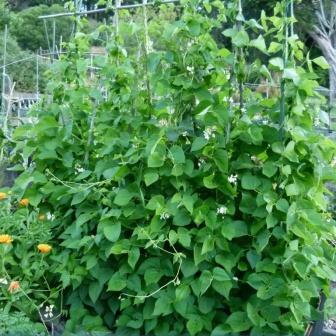 These runner beans ‘white emergo’ have gorgeous white flowers on them but had a slow start due to damage by pheasants. They don’t seem to have suffered in the long term thanks to judicious intervention with a ‘scarecrow‘ motion-activated sprinkler. 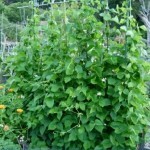 It will deter birds, rabbits, possums, cats and deer if you happen to have them in your vegetable garden. It does need a water connection but is powered by ordinary batteries.